Search for the kingpin of a forgery racket led police to unearth a booty of fake admit cards, answer scripts and Madhyamik and Higher Secondary marksheets. 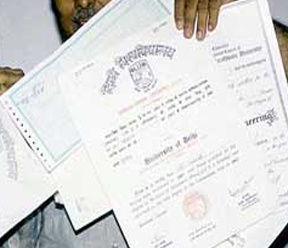 The fake documents were found stashed in a house on Baranagar’s Jadav Chandra Lane. The police raided a house in the Jadav Chandra Ghosh Lane in Baranagar and seized a large number of fake Madhyamik, Higher Secondary and University marksheets along with admit cards and answer scrips.